Actually back on May 18th Allison, Eva and I were on our way home from Orlando but we first had to make a trip to the MarketLeverage Offices. Dina Riccobono arranged for a car to pick us up at our hotel and take us to the ML offices and then on to the airport. We had a great time and everyone was so welcoming. When we arrived Dina met us and brought us to a small table, on it was a MarketLeverage gym bag (Which I use every day that I work out, it is more days than you think) and it was packed inside with special gifts for all of us. Dina had been reading my blog for a while and so she knew that Eva liked Tinkerbell and Allison was in to knitting. Dina picked up a Tinkerbell bracelet for Eva along with a Tinkerbell camera and even a beautiful Tinkerbell dress (see above.) So very thoughtful! Inside there was also a gift certificate for Allison to attend a month’s worth of Knitting Classes at her local knitting shop Yarn it All. How Dina found Yarn it All and got a gift certificate was anyone’s guess. She really does pay attention. Also inside the bag were passes to see Arabian Nights on our next trip to Orlando. And last but not least there were T-Shirts that said BenSpark is Blogging This. 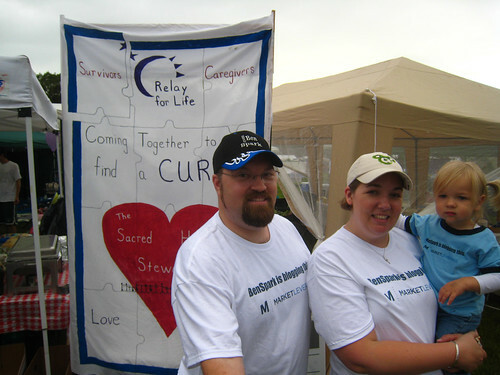 We wore those to the Relay For Life. Dina and the MarketLeverage Staff were fantastic. They even took us on a tour of the offices, or rather Eva took control of the tour early on. Clearly we were on Eva’s tour of the MarketLeverage Office. This is a long overdue thank you and I cannot wait till next Sunday when I’m hanging with the MarketLeverage crew on the Luxury yacht Valiant. I can’t wait! Previous PostCloth Couture Diaper WinnerNext PostMy Foot is Dirtier! So cute! We loved having you guys visit, and have cleared out an office for Eva whenever she wants to start. I can’t take the credit for the custom gifts, Vanessa is quite the super-sleuth. Glad you guys enjoyed the goodies, and we’ll see you Sunday!